HELLO MY POKEFRIENDS! I have MANY PICTURES because I've been lazy and stuff has piled up as a result. I was going to include a photostory in this entry as well, but this ended up so long I decided I'll post that in a separate entry in a couple days. It will feature a newbie named Prescott, who you get to meet in this entry. I figure it's been a while since I made a large post and there's been lots of new members since then, so perhaps a little re-intro is in order! So, hi. 8D My name's Megan, but the majority of the internet calls me Toady or Toedy. I'm a 22-year-old girl living in Canada who aspires to be a published author of YA and fantasy novels. Maybe it's the writer blood, but I talk way too much. Sorry. |D; My favourite Pokemon for ever and for always is POLITOED. <3 I've loved frogs ever since I was alive so that explains a lot. My second favourites are Palpitoad and Bonsly, and my tertiary loves include Turtwig, Stunky, Gible, Bulbasaur/Venusaur, and Wobbuffet. My childhood loves were Raichu and Marill, so I've still got a soft spot for them as well. I've been a Pokefan since the first gen and I still remember the joy when my parents surprised me with Yellow. I've got fond memories of Pokemon Snap and Hey, You! Pikachu!, which induced my 12-year-old self to sleepwalk out of my bedroom one night, where my dad caught and scolded me for being awake and I complained in my sleep that I just wanted to play the game. I sort of fell out of the craze with everyone else but still played the games. Diamond/Pearl are the only ones I've never played (but will soon!). Other than Pokemon, I collect Frog Style, and everyone gives me frog stuff which = MASSIVE FROG COLLECTION that I have hardly added to myself. XD It's pretty awesome. If you read all of that, thank you. C: And now... let's get to the rest of this stupidly massive post! WITH PICTURES. I'm so sorry dial-up users and my Aussie friends. Please still love me when it's over? <3 I did make sure all of the photos are around 50~70KB, though I think there's one or two that snuck into the 80s and low 90s. TYMPOLE, WHAT DID THEY DO TO YOU? I couldn't resist this little fellow who had been living in shiny_vulpix's sales post for a very long time. He's seen much better days and has a (very manly) battle scar. I thought I could give him some TLC and make him feel loved again. QUESTION! Does anyone know the exact release date for the March batch of MPCs? I've been prowling a little for the Palpitoad but I don't see any sign of it yet. Hey guys! Sorry it took so long for me to get crap together. Although, I'll have you know I got accepted in to my University's Nursing Program!!! YAY! :D I'm finally home to enjoy the rest of my spring break and to mail everyone's kids! :D So pay ASAP and I can have everything shipped out this week! I have pictures of everyone's kids so you personally can look at everything and make sure everything is in shape! :D Everyone who has 5 or more kids and am shipping to within the US will be sent via small flat rate box with delivery confirmation included. Everyone within the states who got 4 or less will have delivery confirmation included as well. This is due to the fact that paypal has been hitting down hard on those who don't have validation that everyone's items are received! Alright moving on! Please send ALL payments to dsmith42@students.towson.edu and PLEASE check your pictures and lists to make sure everything is in order. I am not to be held responsible for lost or damaged items in the mail OR incorrect orders as I am showing you now what I've got ready for you! Also I have TONS of extras! Please take them off my hands! Any extras MAY increase shipping unless you have a flat rate box in order in which weight does not matter! All Extras are $1 regular/$3 clears & attacks for participants and $2 regular/$5 clears & attacks for non participants! I'll do a biggish Raichu collection update sometime soon (I've received such a pile of nice Raichu things from you lately!) as well as send lots of feedbacks. Sorry for the wait, I've been a bit ill and busy with my studies (kanji, oh, kanji...). A bit late, but some few sweet gets at a convention I went to recently. Hey everyone! I'm looking to buy a Hunter kid for my husband. I bought him a Gengar a while back knowing that he loves the ghost Pokemon. Then a little bit later I came across a Ghastly, and had to get it for him too! Now I see that I am missing Haunter for this evo line! We can't have that. So I want to surprise him with a Haunter to complete his small ghost kid collection. Oh yeah I forgot to mention he doesn't check this site, so each time it has been a nice little surprise for him. He says he "hates surprises", and gets that cute little grin each time I get him something. the DX tomy and jakks figures are to small around 6 inch,they wont fit with my collection. also what is the biggest torterra figure ? 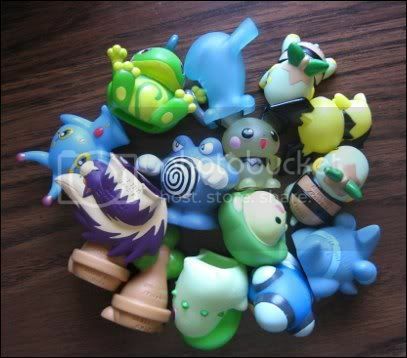 is there a tomy DX torterra ? I need a 7+ inch figure. Hi everyone. X3 I had a question about how to ship cards. I have quite a few TakaraTomy MC figures still for sale. 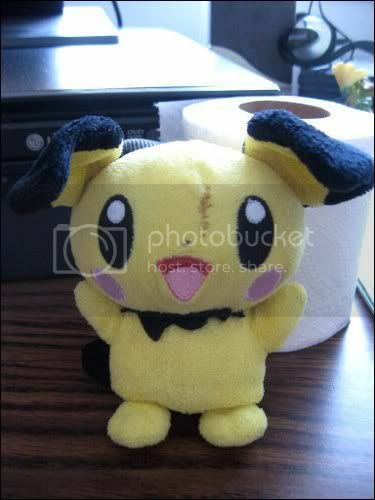 I also have many other pokemon related items on my website that i'd love for you guys to take a look at. Truth about lapras.... offers :P? Does that mean if I choose that option, all the posts/ comments I have made before will automatically be my new username, instead of jantyl? Also, what about the community feedback? Since it's not on LJ but another site, I am not too sure how it works... is there a way to carry it forward? Unfortunately, I've come back from the convention completely empty handed. I didn't find a single kid from anyone's list or from my own. I didn't even find a kid that I halfway considered buying. I don't know if the dealer's stock of kids is running out, if he hasn't restocked in a while, or what - but nothing in the bins was on anyone's list of kids to look for. I'm as disappointed as everyone. But I will save the large list I compiled of everyone's kid requests and continue to hunt, as the same dealer will be at the next two conventions that I'll be attending (one in two weeks and one at the end of May). Again, sorry to everyone who requested a kid, and sorry this post was a little delayed. I'll be taking them to be weighed tomorrow,but will not be shipping until sometime next week :). *I am shipping in bubblemail,please specify if you want a box/insurance/tracking. Hi everyone! Has anybody heard from vaporeonxlover? I haven't heard anything for a couple of weeks. We were originally trading, but both Piplup pokedolls sent to me turned out to be booties. I'm awaiting either the return of my Blitzle plush or a payment. I was told that I would be receiving a payment within a few days, but that was two weeks ago. vaporeonxlover! Please reply to my PMs - I really just want to know what's going on. 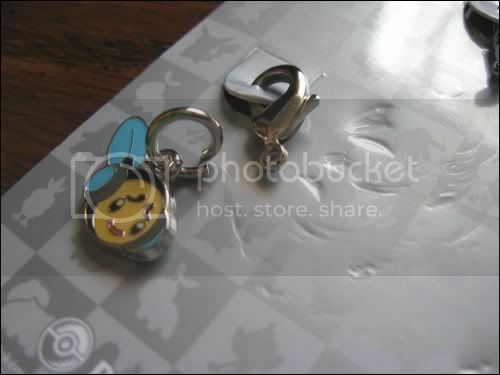 ^^; I'll send back the Piplup once I receive the payment/the original Blitzle Tomy. Note - trades may be a little slow, I have exams that are soon approaching! I prefer US trades first, but I'm open to international trades! I have plush for sale and will be adding charms!! Gen 1, 2 and 5 are what I have. Eeveelutions, individuals from sets and 1 set.